The San Diego East County Chamber of Commerce Tuesday announced its support for Proposition 6, which would repeal California’s gas tax, among a suite of endorsements for local races and state propositions. Proposition 6 would repeal the state’s 12-cent tax on unleaded fuel — which rises to 19.5 cents per gallon in 2020 — and 20-cent tax on diesel fuel. State officials say the assessments raise about $5 billion per year to fund repairs and improvements to transportation infrastructure. 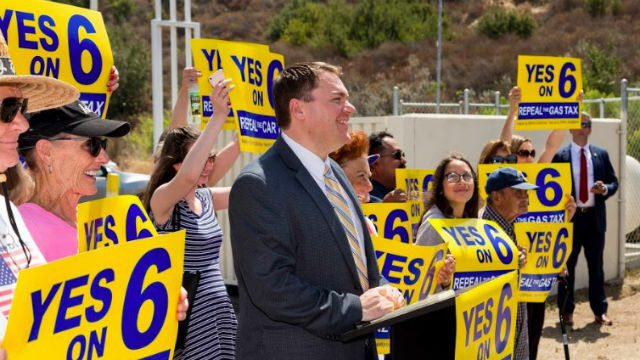 Former San Diego City Councilman Carl DeMaio is the chairman of the Yes on 6 campaign. In addition to the group’s support of the gas tax repeal effort, the chamber endorsed nine candidates for local government seats: El Cajon mayoral candidate Bill Wells, Lemon Grove City Council candidate Jerry Jones, El Cajon City Council candidate Gary Kendrick, Santee City Council candidates Ronn Hall, Laura Koval and Rob McNelis, La Mesa City Council candidates Guy McWhirter and Bill Baber, and Helix Water District Board of Directors candidate Dan McMillan. All except Koval are incumbents. “The chamber’s vision is to provide leadership to improve business competitiveness, and these local East County candidates strongly fulfill our criteria,” said chamber CEO Eric Lund. The chamber took “yes” positions on propositions 5, 6 and 11 while urging voters to reject Proposition 10, which would repeal the Costa-Hawkins Rental Housing Act, allowing local governments to enforce rent control on any kind of rental housing. Proposition 5 would allow homebuyers older than 55 to transfer property tax assessments to a new home and Proposition 11 would allow emergency services to mandate that ambulance workers remain on-call during their meal and rest breaks. The 650-member organization represents businesses in eastern San Diego County, including the cities of El Cajon, La Mesa, Lemon Grove and Santee.